Many years ago, I lived in a house near Oxford that backed onto the famous Wytham Woods, owned by the University and essentially, and deliberately, left untouched for centuries. I got to know the forester quite well, and he told me that one day, just as dawn was breaking, he was walking along one of the wood’s paths with a young golden retriever he was still training. He turned a corner in the woods, with thick undergrowth on either side, and suddenly the inexperienced dog broke forward and dashed away in front of him. Down the path, ambling along towards them, was a big old male badger. The forester did not have time to call the dog back before she had rushed towards that ancient denizen of animal wisdom and deep burrows. As the dog reached the badger, he lifted one huge powerful fore-paw, and with one swipe knocked the dog dead. Then, instead of turning aside or back, the badger simply continued ambling down the path towards the forester. He stood, stock still, beside the path, and he told me that as the badger passed by him, only a foot or two away, the animal looked up at him, straight into his eyes, and held that look. Many years later, sitting outside on the deck of our house in the country near Wetaskiwin with a couple of friends on a sunny summer’s evening, there appeared on the short gravel driveway a pair of young, ruddy-brown fox cubs. I knew the vixen had been denning under an old shed on my neighbour’s property, but I hadn’t seen the cubs before. What fun they were having, frolicking with each other, rolling over in the gravel, until they saw us sitting there watching. Then curiosity overtook play – they probably hadn’t seen humans before. Without any sign of fear, they tiptoed carefully further up the drive, coming to inspect us. It was a magical moment, two so different types of creature who nonetheless shared the same natural space, both fascinated with each other. Then suddenly, out of nowhere from behind us, underneath one of our chairs, shot the diminutive all-black matriarch of the yard, the barn-cat Black Cat. She launched a blur of black fur straight at them, and the two poor cubs, taken completely by surprise, fell over themselves to race back to their den, chased by Black Cat until she was satisfied they had successfully been put to flight. Then she turned, and walked back slowly to us, so proud of herself. Imagine both scenes, and then add music to describe all the emotions that words are so limited for – joy, awe, humour, play, surprise, sadness, curiosity, connection, magic, natural wonder – and you are getting somewhere near the miraculous magic that is Janáček’s The Cunning Little Vixen. What music it is, too, yearning, shifting, dancing, loving, all the time with the lilt and lift of how people actually speak. And the idiom is inimitable (and has never really been imitated) – you can recognize a piece is by Janáček in about three measures. Even more remarkable, this ultimately completely unsentimental peon to the magic of nature, to its inexorable unfolding of the circles of life and death, to the inextricability of the human place in that nature, was written when Janáček was 70. It’s a daunting opera to put on, though, for it has a large cast, it needs really to be sung in Czech, and few Canadian musicians and singers are familiar with the very idiomatic style of the Czech composer. It is not normally an opera associated with young, post-undergraduate vocal forces, for those very reasons, so all the more kudos to Opera Nuova for not only presenting the work (almost certainly for the first time for most of the audience) as part of the 2017 Opera Nuova Opera & Music Theatre Festival, but also for making such a success of that presentation. The Festival allows the young singers of the Opera Nuova training program, just starting, or about to start on, their professional careers, the opportunity for fully staged opera performance. This year there were 59 young singers from across Canada, and four main stage opera productions. 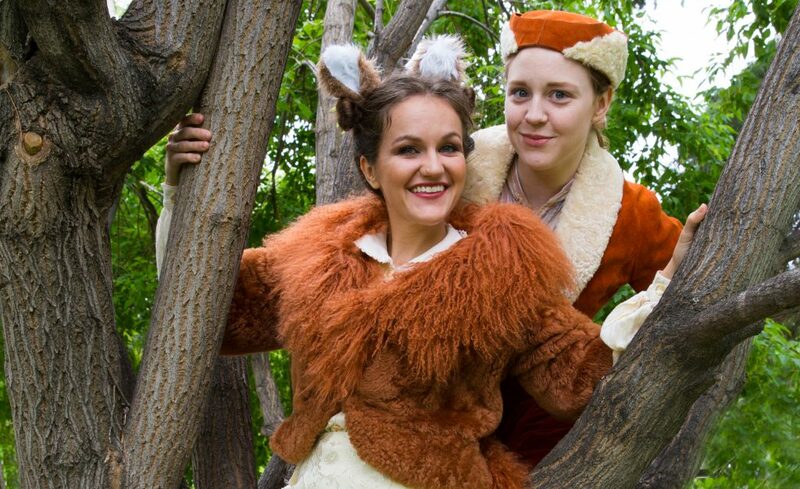 These were all double-cast, to provide the widest opportunity for the participants, and I saw the Thursday July 29th performance of Cunning Little Vixen at Sherwood Park’s Festival Place. One of the advantages of the opera for a program like this, which traditionally has more women than men participants, is that, while there are important male roles, the majority of the animal roles are given to female voices (including the dog-fox whom the vixen marries). There are, perhaps, two ways to approach Cunning Little Vixen (and I have seen both). The first is to emphasize the human qualities – the anthropomorphization – of the animals (and in the opera the animals can understand what the humans are saying, but not vice-versa). The second is to do the opposite, and emphasize animal movements and make them as realistic and as naturalistic as possible. Brian Deedrick’s production rather combined both approaches. The chorus of the animals, birds, and insects of the woods were largely naturalistic (with some engagingly realistic movement from the uncredited squirrel). The result of this was to place them behind a kind of invisible barrier when the humans were involved, both spiritually and physically. In contrast, the major animal characters, while still having some animal movements (the cockerel, hens, and Chelsea Kutyn’s Lapák the dog in particular), were primarily played as humans with animal characteristics (and in the case of Jillian Bonner’s Zlatohřbítek – Gold-Spur the fox – or Xuguang Zhang’s badger, almost entirely human). The result of this was to place them much more in the realm of humans, and if that divide was there between chorus and humans, to a certain extent it was also there between the chorus and those anthropomorphized animals (the badger was a good example). The colourful costumes – nine of which were designed by Leslie Frankish for Pacific Opera, and the rest designed and created by Stephanie Bahniuk – were similarly ambivalent, some seeming to veer towards a humanizing of the animals, some more obviously trying to recreate animals. All this had some unexpected consequences, discussed below. That being said, overall the movement – and the consistency of movement within a large cast – was captivating, drawing the audience into a world that was fantastical and natural both at the same time, not the least because of the involvement of Citie Ballet in the extended orchestral passages that demand dance. They (very successfully) helped to train the movement of the singers, and there were three main Citie Ballet dancers taking roles in Kiera Keglowitsch’s choreography. Mingyi Liang as a tall willowy Blue Dragonfly (beautifully costumed) was the closest in the production to a pure spirit of nature, well supported by two midges (Jinah Kim and Lydia Redpath), though they looked much more like bees. That costume ambivalence was here, too, the Dragonfly more naturally magical, the midges more human in their skirts. Deedrick emphasized the humour in the piece more than in any other production I have seen. Sometimes this was enormously entertaining, but at other times it was annoying, loud laughter from the audience appearing at inappropriate moments. Perhaps this was inevitable with a youthful cast, but the point of the humour in the opera is that it is only one part of the whole panoply of life that Janáček presents. Commendably, Deedrick ensured that the Vixen’s death was completely unsentimental (no weepy handkerchiefs here). Janáček added her death himself – it’s not in the novel on which the opera is based – to make the point that death is part of the whole natural cycle of life. In the end, though, I did rather miss the magical power of nature that infuses the work, in part because of the over-emphasis on the comedy, and in part because of the ambivalence in style and costume between animal and human. What was missing in the end was Janáček’s message that humans are just as much a part of that nature as the animals, birds and insects. Here, in spite of Andrew Erasmus’ final lines as the Forester, and perhaps inevitably in a world that is now so urbanized and so out of touch with the natural world, were two solitudes. Yet today surely this is the most important massage from Janáček’s opera. I don’t want to give the impression that this production was therefore not enjoyable – just the opposite, as it was consistently engrossing. It very nearly, but just not quite, showed the full range of power and depth in this opera. The cast were uniformly effective – and are to be congratulated on so coming to terms with the idiom. Even if their pronunciation was at times a little wayward, to have sung it in Czech was not only invaluable experience for them, but honoured the opera. It’s a bit invidious to single out anyone from a young ensemble, but there were two outstanding performances from the cast I saw. The first was Andrew Erasmus as the Forester. He is a big man with a big baritone, and, one suspects, a big future. Winner of the People’s Choice Award at the 2016 Metropolitan Opera National Council Auditions Western Canada District, he is about to study at the famed Guildhall School of Music and Drama in London. His acting is still a little rough at the edges, but that rather suited the gruff but ultimately compassionate Forester – one well believed from Erasmus’ performance that the reason that he doesn’t kill the Vixen himself is that he can’t bring himself to do it. There is no doubting the quality of his voice – this was a convincingly sung performance, both in the woods and in the rather different side of him in the pub. The role of the Vixen is indeed a difficult one. One the one hand she has to be young, bright-eyed and coquettish, on the other Janáček gives her vocal lines (as he does for almost all the major women roles in his operas) utterly different from those in, say, his contemporaries Puccini or Richard Strauss. There is very little call in Janáček operas for those soft floating high soprano notes that are endemic to Puccini and Strauss love scenes – instead, a kind of hard steel is needed in the upper register (reflecting that, however playful they might be, most of Janáček’s women do have a hard steel side to them). Even Lucia Popp, whose voice had that remarkable girl-like purity when she wanted it to, doesn’t quite pull it off in Mackerras’ famous Decca recording of the opera. She ends up sounded a little too matronly. The most successful is perhaps Hana Böhmová in Neumann’s first Czech recording in mono from 1958 (still the most satisfying overall recording). I’m not going to claim that Irina Medvedeva is a Lucia Popp or a Hana Böhmová, but she was awfully good in the role in Festival Place, on a number of counts. First her charismatic acting was utterly convincing – winsome, sharp-eared, full of the joy of life and with a little sardonic humour, but intense when needed. Second, she has that steely upper range, while still managing to sound young, and (like Erasmus) the sense of a confident command of the idiom. Third, with her Russian background, her Czech came more naturally than for many in the cast. I have long thought (and I am not the only one) that Janáček essentially fell in love with his vixen (hence the wonderful meditation on old age at the end), and seeing Medvedeva’s performance, well can well understand why. Both these two young Canadian singers are well worth keeping an eye on, and I look forward to hearing them again. The weakest link was the orchestra (Rosemary Thompson’s conducting, however, sounded just exactly right in pacing and in support for the singers). This wasn’t entirely their fault: the idiom is a very difficult if one has never encountered it before, and the reduced orchestration – essentially one instrument to a part – not only left the players very exposed, but inevitably could not recreate the depth of orchestral sound that is such an important element of Janáček’s style. Nonetheless, they pulled it off, in a production that was a considerable achievement for all involved, and a definite feather in Opera Nuova’s cap. Last, but not least, a mention for the very effective set by Terry Gunvordhahl, well supported by lighting designed by Stephanie Bahniuk. The set uses a number of mobile units based on tall upright poles, and capable of a multiplicity of arrangements, especially when accompanied by screens of other wooden elements flown in. It made for a very effective wood for all the animals, morphed very naturally into the farm yard, and yet was versatile enough to set up the pub. What was even more remarkable is that it was the same set as used in Opera Nuova’s Carousel (and I will be writing about it in my review of the musical), yet never once looked like it.